^ a b c 小野里歩 2000. ^ a b グループZero 2006. ^ 佐伯明 2003, p. 12. ^ a b 佐伯明 2003, p. 11. ^ a b 佐伯明 2003, p. 9. ^ a b 別冊カドカワ 2003, p. 24. ^ a b 別冊カドカワ 2003, p. 38. ^ 佐伯明 2003, p. 472. 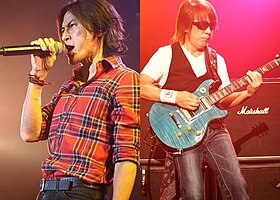 ^ a b B'z Unreal Music 2000, pp. 165-166. ^ B'z Unreal Music 2000, pp. 41-43. ^ B'z Unreal Music 2000, pp. 58-59. ^ 佐伯明 2008, p. 125. ^ B'z The Book 1998, p. 90. ^ B'z The Book 1998, p. 72. ^ a b B'z Unreal Music 2000, p. 38. ^ a b B'z The Book 1998, p. 8. ^ 佐伯明 2008, p. 87. ^ a b c B'z Dictionary 2003. ^ a b 佐伯明 2003, p. 13. ^ 佐伯明 2008, pp. 85-86. ^ a b c d 佐伯明 2003, pp. 14-17. ^ 別冊カドカワ 2003, pp. 24-25. ^ a b 佐伯明 2008, pp. 91-93. ^ a b 佐伯明 2008, pp. 94-95. ^ B'z Unreal Music 2000, pp. 36-37. ^ 佐伯明 2003, pp. 17-18. ^ 別冊カドカワ 2003, p. 25. ^ B'z The Book 1998, p. 91. ^ B'z The Book 1998, p. 33. ^ 佐伯明 2008, pp. 134-135. ^ a b 別冊カドカワ 2003, pp. 93-94. ^ a b c B'z Unreal Music 2000, pp. 119-120. ^ B'z The Book 1998, p. 59. ^ クレイグ・グレンディ, ed (2010). ギネス世界記録2011. 角川マーケティング. ISBN 978-4048954075.